Musician, singer, and songwriter Jared Stewart of Crow Agency, Montana, performs a combination of blues, rock, and pop to open the 2004 Plains Indian Museum Seminar. The seminar celebrated the living traditions of music and dance for Native people of the Great Plains. Chris Gimmeson photo. 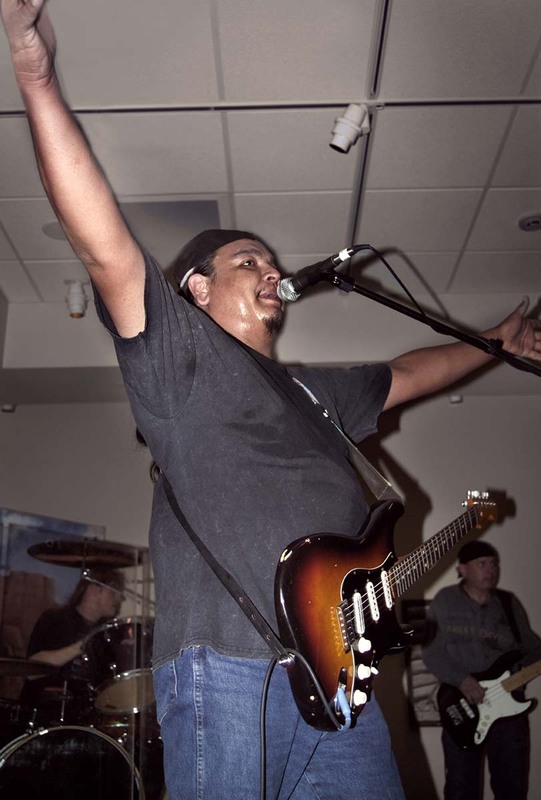 A Points West interview with Musician Jared Stewart, with thoughts by Joe Medicine Crow. Musician/singer/songwriter Jared Stewart is smart, talented, funny, and soft-spoken, yet confident about everything he does—from his music to his commitment to his people, the Crow Nation of Montana. He comes prepared, works hard, and always gives his best effort. Stewart and his band, including John Culbertson on drums and bassist Bryan Vigessa, performed for the opening of the 28th annual (2004) Plains Indian Museum Seminar, Enduring Expressions: Music and Dance of the Great Plains. During Stewart’s September 30, 2004, performance in Cody, it was evident that Stewart and his band have the work ethic, versatility, and talent to make it big. The 2004 Plains Indian Museum Seminar focused on the profound significance of music and dance in expressing tribal cultures, histories, beliefs, and traditions, according to then-Plains Indian Museum Curator Emma I. Hansen. Seminar presentations addressed several topics including men’s and women’s traditional songs, Christian church songs in Native languages, and powwows and other celebrations. 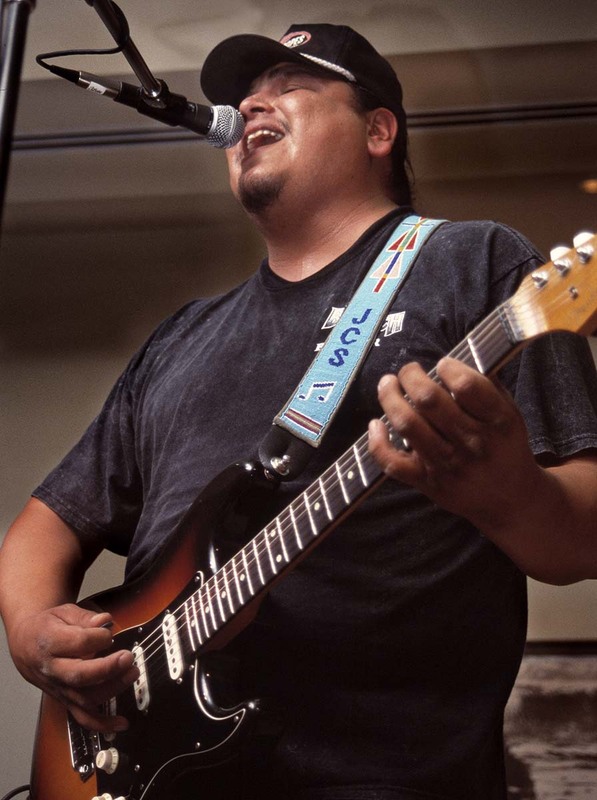 “Jared Stewart’s performance reinforced the understanding that contemporary Plains tribal musicians express their experiences and emotions through many musical genres—including rock and blues—as well as traditional music,” Hansen said. Stewart, 33, of Crow Agency, Montana, has been playing the guitar for 15 years. His music appeals to a variety of tastes—blues, rock, and pop. The band’s live shows combine unbeatable covers with great original tunes, reflected on his second album Indian Summer. Stewart and his band are asked to open for most national acts that perform in the region surrounding Billings, Montana. They make a special effort to perform at American Indian events such as the annual conference of the National Indian Education Association; and with nationally recognized Native American artists such as Native Roots and Robert Mirabel. Points West: How did you get started in music? Stewart: I guess you could say I wanted to show off for a girl (his wife, Carla Stewart). PW: Did you come from a musical family? Stewart: No, not really. I have had aunts, and my dad sang a little. Nothing professional. It’s all just singing in church and things like that. And then all of a sudden I just picked up a guitar. I went to the band director and asked him to write out chords. Then I started playing. I started hearing all the little things; and pretty soon I was walking around in Lodge Grass (with a guitar). Little kids always make fun of me because I’m walking around with a guitar. To them, that is foreign, because if you don’t have a basketball in Lodge Grass, you don’t have anything. And here I am walking around with a guitar, and people teasing me, “Play ‘La Bamba,’ play, ‘La Bamba,’ and then, all of a sudden, here it is a few years later, and we’ve gotten to do shows on the same bill as Los Lobos, you know? So it kind of goes around. PW: There are not a lot of musicians on the reservation? PW: Do you think you are passing that on now? 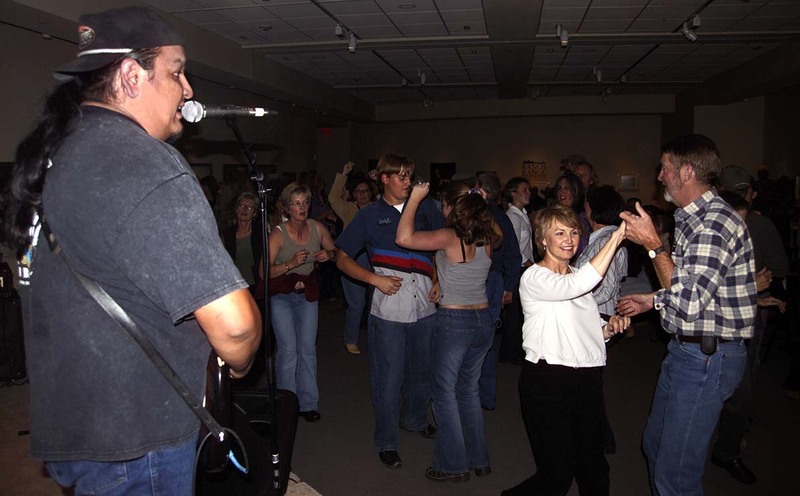 Concert-goers take to the floor to dance during the September 30, 2004, concert at the Center. Chris Gimmeson photo. Stewart: I think I am now. I speak at the high school level, junior high, and elementary level. I sing for them. I try to inspire them. I have even gone to MSU (Montana State University) Billings and Bozeman. I go around, and I tell them my story. How I was involved in drinking and drugging. And how I cleaned up and basically turned my life around, and I must have turned it around enough because you want to know how it happened. PW: What is your message when you speak to children at schools in Lame Deer and Crow Agency, Montana? First I tell them to go out and try hard. If people are mean to you, don’t be mean back. Go out and get new friends. Get away from shame-based feelings. If people are teasing you, it’s OK. If you weren’t doing anything good, they wouldn’t say anything about it. PW: You learned to play the guitar on your own? Stewart: I did try to take some classes when I went to school in Bozeman. It was like beginning guitar, and everything they were showing I already knew. In the middle of it all, I moved into an intermediate level class, and that wasn’t much more than I already knew, and I was showing stuff to the other students in there. After I quit school, I started playing professionally. You’d have to see it. It’s hard to describe how I play; hard to describe how we play. We interact so well. It’s just like how you see these birds flying. They don’t necessarily have a leader, but how do they follow each other when they are in flight? For us it’s the same way. We kind of do that. It’s always the same presentation because it’s no-holds barred. There’s no tomorrow in it. We have to do it all now. I always think there’s no guarantee that I will make it home tonight, so I want to give it the best that I possibly can while I am here, because I don’t want people to say that I didn’t, or that I didn’t even try. That complacency—I don’t want to have that. I always want to give it everything I’ve got. Tear my fingernails away from my fingers, blow out my voice, and just do it till you can’t do it anymore. They always say that too much of a good thing is not good, but not for me where music is concerned. Stewart strikes a characteristic pose during his high-energy show. Chris Gimmeson photo. A lot of people are afraid to put their hearts on the line. We’re not like that. We put our hearts and souls on the line. We don’t care what people will necessarily think about it or say about it, because, you know—that’s what separates the men from the boys. There are those who play at a certain level and never achieve anything more. Then there is us. I would say we’re somewhere in the middle as far as professional musicians go. We’re not on the lower side—like the regular cover bands out there. We play covers, but we do our own renditions. Granted, the music sometimes doesn’t sound the same, but the melody is there, and then you might be singing along after a while. It’s all about that passion. You have to have that. Or why do it? Why even try? I’m sure you can understand that. You know what it’s like to try to entice people to come in and see what you have to offer (at the Buffalo Bill Center of the West). By whatever means you need to do that, and let people see the history. Let them see the different cultures, and let them see where they meet, and how we can react from that. That’s one of the cool things about the band. They’ve never looked at me for how I look, but took me more for what was on the inside. John (Culbertson) wouldn’t stick around if what he heard was just blasé. PW: Who writes your songs? Stewart: I do all the writing. PW: Do you make your songs for anyone, or with anyone or anything in mind? Stewart: Just situations. You think of everyday situations. How would you look at it from your perspective, another person’s perspective, and then even further? You see somebody watching a relationship or something and you see how the interaction goes. There is a lot of that on the first CD (No Color in the Blues). The second one (Indian Summer), not so much. It is more of what we do live. It was supposed to be a much quicker project, but then it turned out that, due to circumstances beyond our control, it took me over a year and a half (to produce). It has gone well for us. The first CD, though, there’s a lot more original material on there. They’re just good stories. Whether it’s unrequited love, betrayal, devotion, it’s all there—all the facets of a relationship. I am not going to say I am an expert at any of that. PW: What’s your method of writing? Stewart: I just sit down with my guitar and usually have some kind of an idea musically, and then I’ll just try to get it to flow. And then start thinking of where I can fit the melody in, and where the count is at. I just try to stay within the lines and then try to get the phrasing right. Then I start thinking of the background parts, if there are going to be any background parts, or even additional guitar. How the drums might sit, and the bass. I kind of already have that pictured in my mind. So that when we go in and start working on the song, I’ll suggest to John what I think might work the best, and we go from there. They just evolve. We’ll put it down, and then we’ll do the drums first. The drums always have to be sounding to the standard that he (John) wants them. We won’t go until he’s ready. I might call the shots one way, but if he’s not ready on stage—there’s no way around it, we wait. He’s the foundation; he’s the rock that we stand on. PW: Who have you been listening to lately as you drive to different gigs? Stewart: Whatever he (John) brings along. Sometimes he doesn’t like what I am listening to. I listen to everything. It could be anything from Stevie Ray (Vaughn) to AC/DC to some old blues. I even get into eighties-type music and even seventies disco stuff. I like the grooves and the orchestration of the music (of seventies disco). I don’t necessarily listen to some of the songs for the subject matter. Take the songs of the Bee Gees, for instance. They use a full string section along with a standard rock arrangement, and then they start layering their vocals. They start fitting all these parts. You listen to things like that and it helps you envision how you want to make things more elaborate. That’s why I said I like to listen to them for the orchestration and the basic groove. It’s got to have that (starts clicking fingers). It’s just like your heartbeat; it’s got to have that. It’s got to click with you somehow. If it doesn’t, then either there is something wrong with the band, or there’s something wrong with you. Dr. Joe Medicine Crow shared some thoughts about Jared Stewart during the concert. He and Stewart are descendants of Crow warrior and leader White Man Runs Him. Dr. Joe Medicine Crow, a founding member of the Plains Indian Museum Advisory Board, shared some of his knowledge of Jared Stewart’s upbringing and commented on the musician’s success. 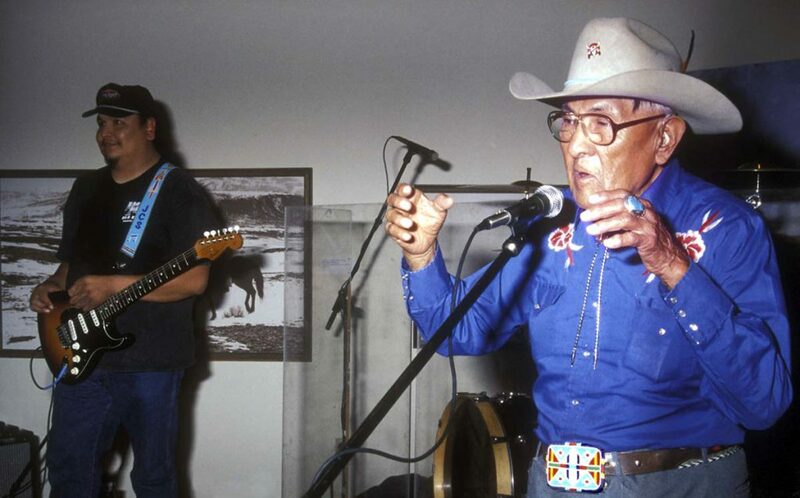 Medicine Crow appeared with Stewart during his concert to open the 2004 Plains Indian Museum Seminar. Medicine Crow and Stewart are both descendants of White Man Runs Him, a Crow warrior, leader, and one of George Armstrong Custer’s scouts at Little Big Horn. Medicine Crow noted that Jared is named after his grandfather, Has Many Arrows. One of Jared’s aunts told Medicine Crow that when Jared was a youngster, he would play with her guitar and eventually start playing tunes. She gave him the guitar. When Jared was in Lodge Grass High School, he sang in the choir and sometimes sang solos, according to a brother of Jared. Soon he was going to church summer camps and other events and providing music. Eventually he was in demand, so he formed his own band. He moved to Billings, Montana, and started playing in casino bars for dances. January 4, 2019 editor’s note: Joe Medicine Crow passed away April 3, 2016, at the age of 102. Read Plains Indian Museum Curator Rebecca West’s tribute to Medicine Crow in this blog post.